It’s been more than a year since I last posted a cheesecake recipe here! 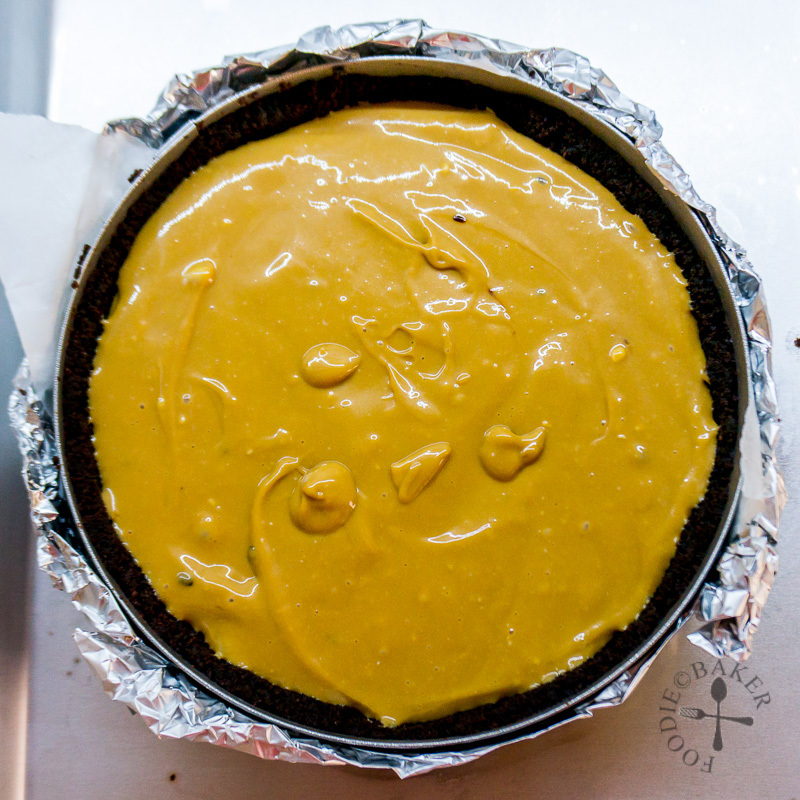 The reason why I seldom bake cheesecakes these days is because there’s a bit of planning involved – and I’m just not a planner person when it comes to cheesecakes. 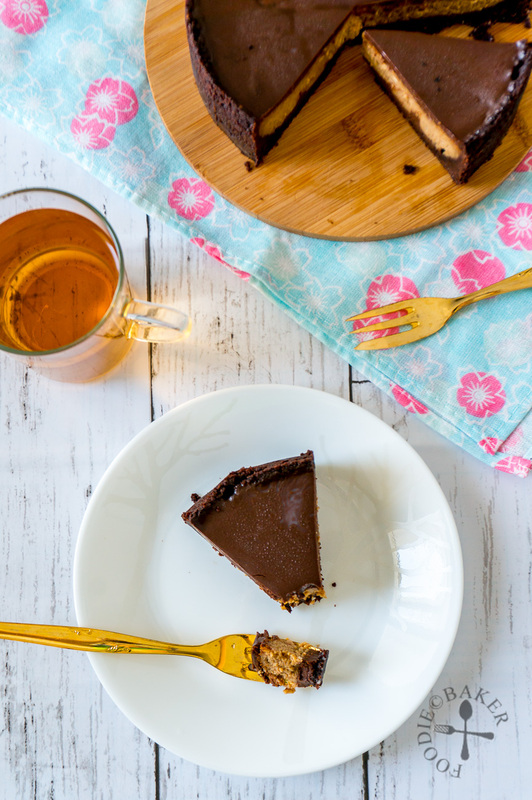 Whenever I have a craving for cheesecakes, I usually won’t have the ingredients on hand – the cookies need to be baked from scratch and the right cream cheese is only stocked in a certain market which I go once every fortnight. So it’s really hard to bake a cheesecake impromptu. 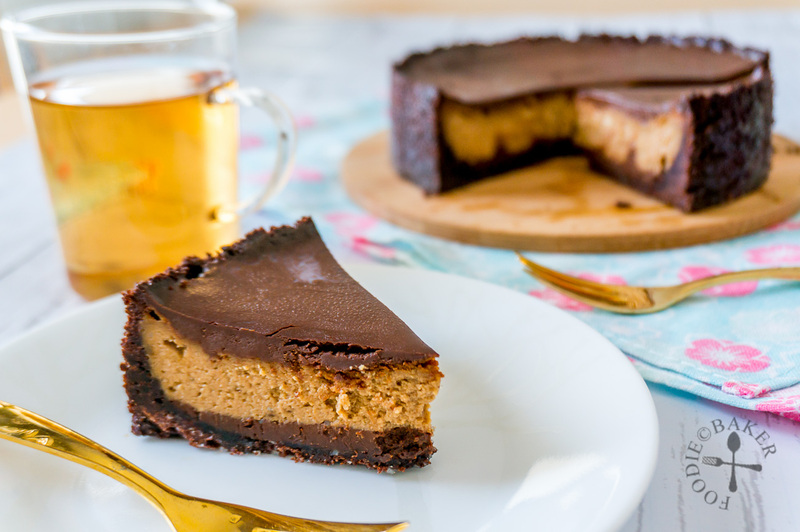 So in order to make this Coffee Cheesecake, I had to plan – I made the cookies a day ahead, and on the actual day, I made the cheesecake early in the morning so there’s plenty of time for it to chill for the photoshoot in the afternoon – and I’m so glad that everything worked out perfectly, from the execution right down to the taste! 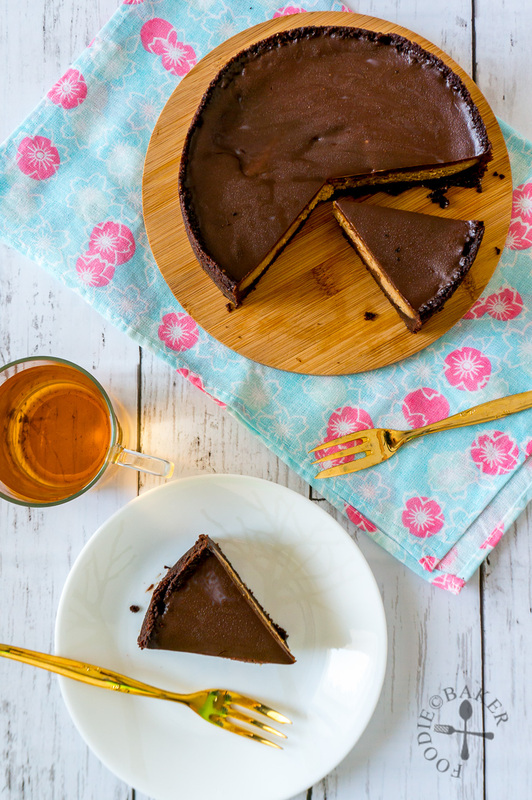 This Coffee Cheesecake has three components – the “Oreo” crust, chocolate ganache and coffee cheesecake filling. The crust is made with my homemade Oreos, and because I love the crust, I made quite a lot of it to press it all the way up the sides of the cheesecake. The chocolate ganache is made with dark chocolate (our favourite) and spiked with a generous spoon of coffee and rum. It is split into two portions – one portion is added to the crust and the other is added on top after the cheesecake is baked. 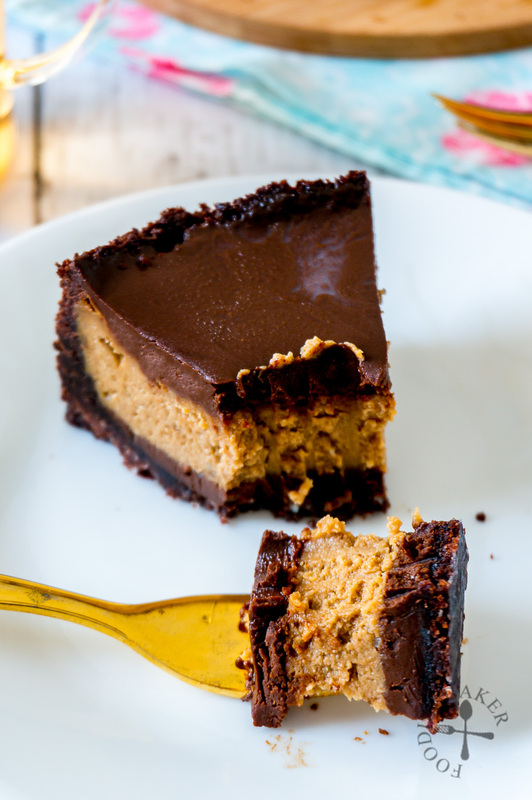 With spiked bitter chocolate sandwiching the dense and creamy coffee cheesecake filling and a crunchy crust, every bite is pure heaven for the coffee and chocolate lover in me! The proportions have been scaled down from the original recipe to make a small cake because I only bought 200 grams of cream cheese – and the resulting cheesecake which was just nice for us and 2 of our friends, with two slices leftover to enjoy over the weekend. The coffee cheesecake was made in a cake ring as I don’t have other 16-cm (6-inch) cake tin, and because it’s a cake ring (no base), I wrapped it with parchment paper and aluminum foil (aluminum foil on the outside to hold the parchment in place), so the butter from the crust won’t ooze everywhere. I didn’t bake in a water bath because I’m lazy and I didn’t get any cracks (and even if I did, they would be covered up by the chocolate ganache so I didn’t really care). A few days ago on 30 July is National Cheesecake Day today, so here’s a brief history on cheesecakes before I leave you with the step-by-step photos and recipe! Cheesecake is thought to originate from ancient Greece – apparently it was served to athletes during the first Olympic Games in 776 B.C., though the cheese used was sheep’s milk cheese. This cake was passed to the Romans during their conquest of Greece, and they named it placenta. It is more like a cheesecake as it has a pastry base (or it’s baked inside a pastry case). By 1000 A.D., the popularity of cheesecake had spread throughout Europe, though cream cheese is still not used in cheesecakes then – because it was not invented yet! In 1872, William Lawrence, an American dairyman, invented cream cheese by accident (a true blessing in disguise!) and distributed his cream cheese under the label Philadelphia Brand Cream Cheese. The brand was then bought over by Kraft in 1928. Cheesecake made using cream cheese became popular in the 1900s in America – and Arnold Reuben, owner of a restaurant in New York City, claimed in 1929 that his family was the one who developed the first cream-cheese-based cheesecake. 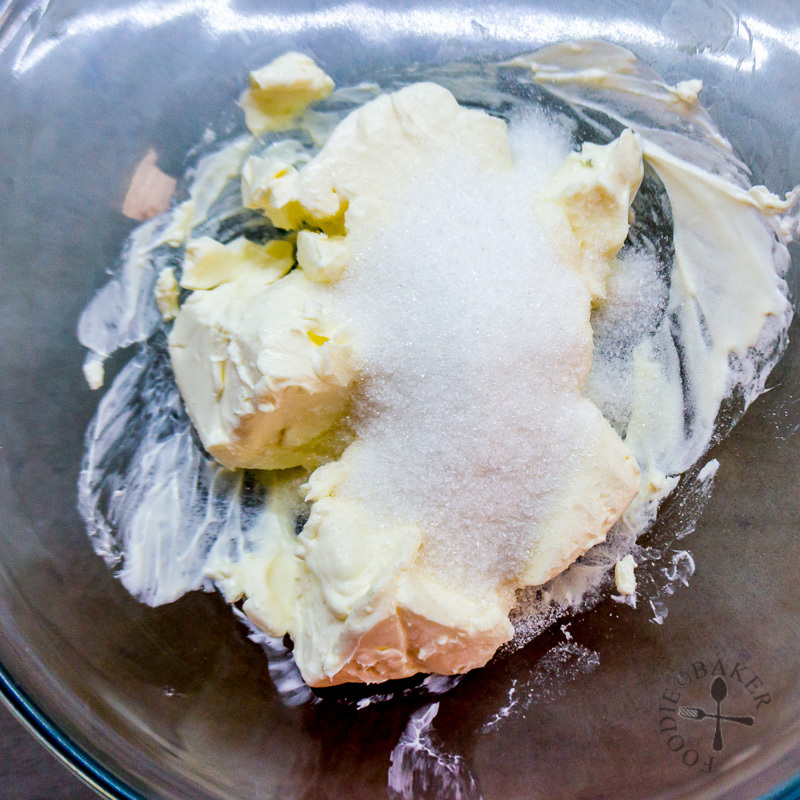 1) Smash or process cookies into crumbs and combine with melted butter. 2) Press the crumbs onto the bottom and sides of a 16-cm diameter x 4.5-cm tall (6-inch x 2-inch) cake tin, it will come up to 4-cm (1.5-inch) tall. Chill in the refrigerator while you make the Chocolate Ganache. 3) Microwave chocolate, cream and instant coffee in 30-seconds intervals, stirring every interval, until chocolate has melted and mixture is smooth. 4) Stir in rum. 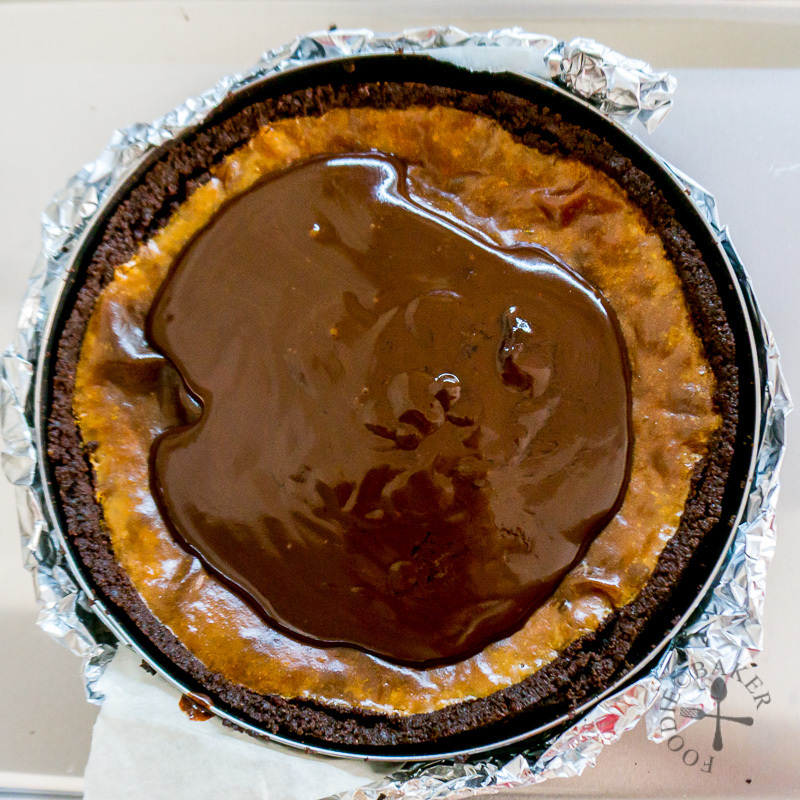 5) Pour half of the Chocolate Ganache mixture into the Cheesecake Crust. Reserve the other half for the topping later on. Freeze the Cheesecake Crust for 30 minutes. 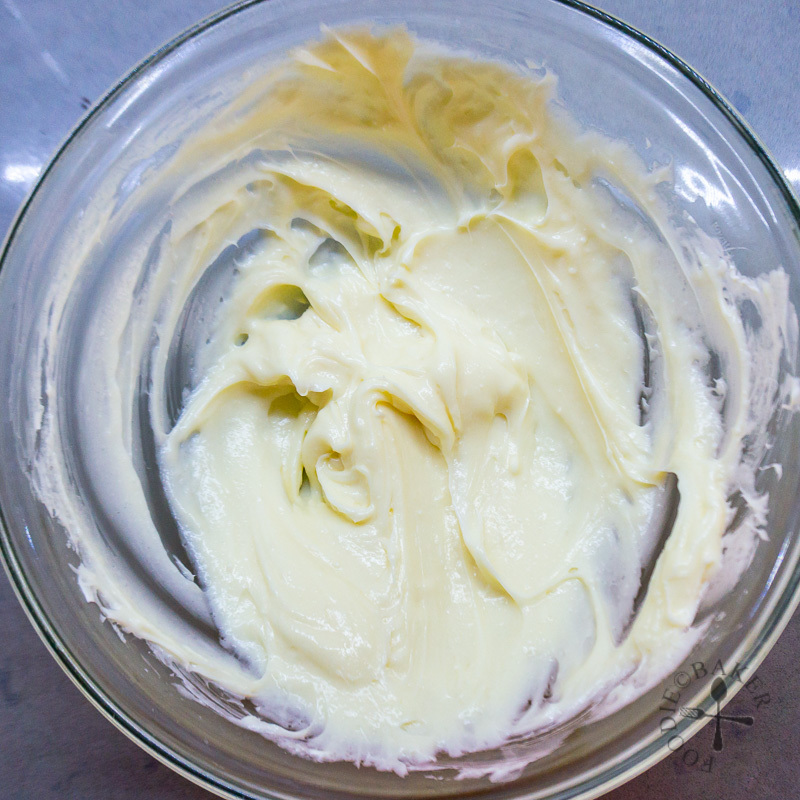 6) Place the softened cream cheese and sugar in a mixing bowl. 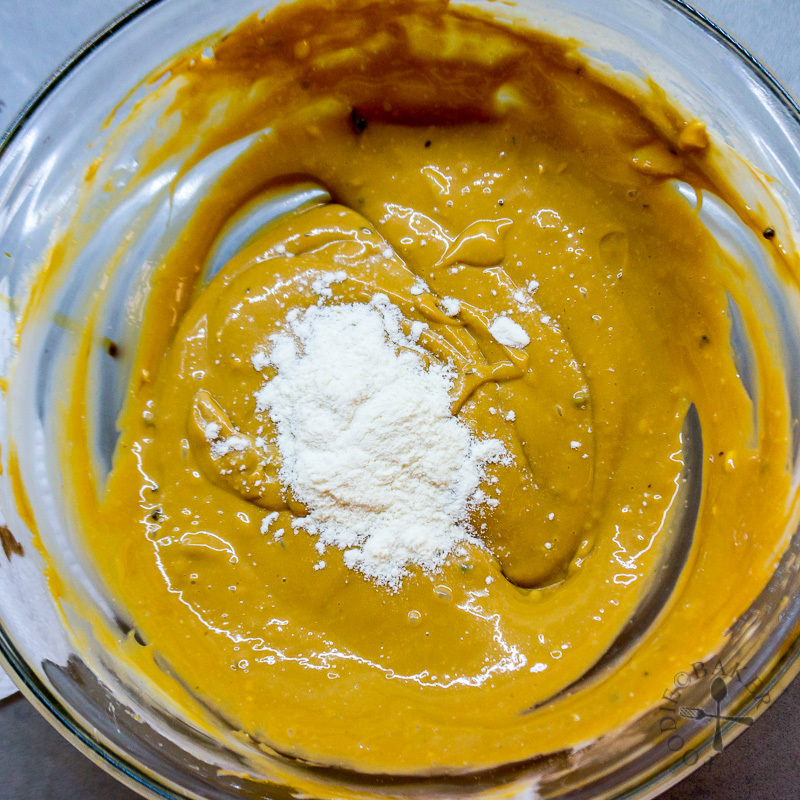 7) Beat on low speed with a handheld electric mixer (or you can mix manually with a wooden spoon) until the mixture is creamy - the sugar granules won't dissolve completely but it's okay. 8) Stir in the coffee, rum and vanilla (coffee is pre-dissolved in the rum before mixing in). 9) Stir in the egg. 10) Lastly, stir in flour. 11) Pour the cheesecake batter into the frozen Cheesecake Crust. Bake in the middle rack for 45 minutes to 1 hour, until the cheesecake jiggle slightly in the center. 12) Place the baked cheesecake on a wire rack and let cool for 30 minutes. Pour the ganache over the cheesecake and spread to cover the top completely. Chill the cheesecake in the refrigerator for at least 4 hours until completely cold, preferably overnight. Now all you need to do now is to slice and serve! Inactive time to chill the cheesecake not included. The cheesecake is best made a day in advance so that it has sufficient time to chill properly. Process cookies in a food processor or place the cookies in a ziploc bag and smash with a rolling pin until they resemble fine crumbs. Mix in melted butter until the crumbs are moist. 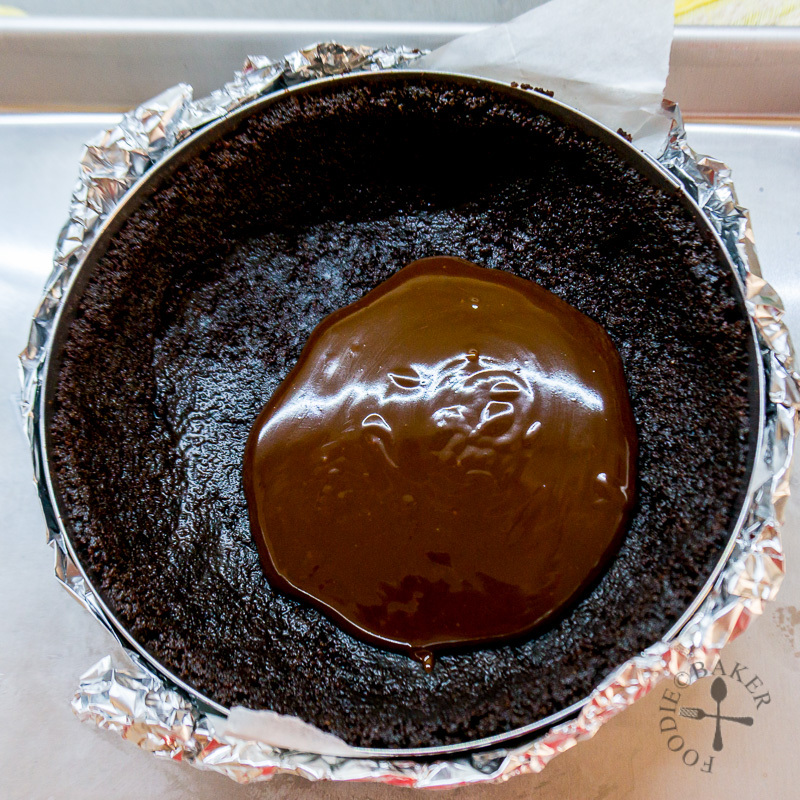 Tip the crust into a 16-cm diameter x 4.5-cm tall (6-inch x 2-inch) cake tin with a removable base (or a cake ring or a springform tin). 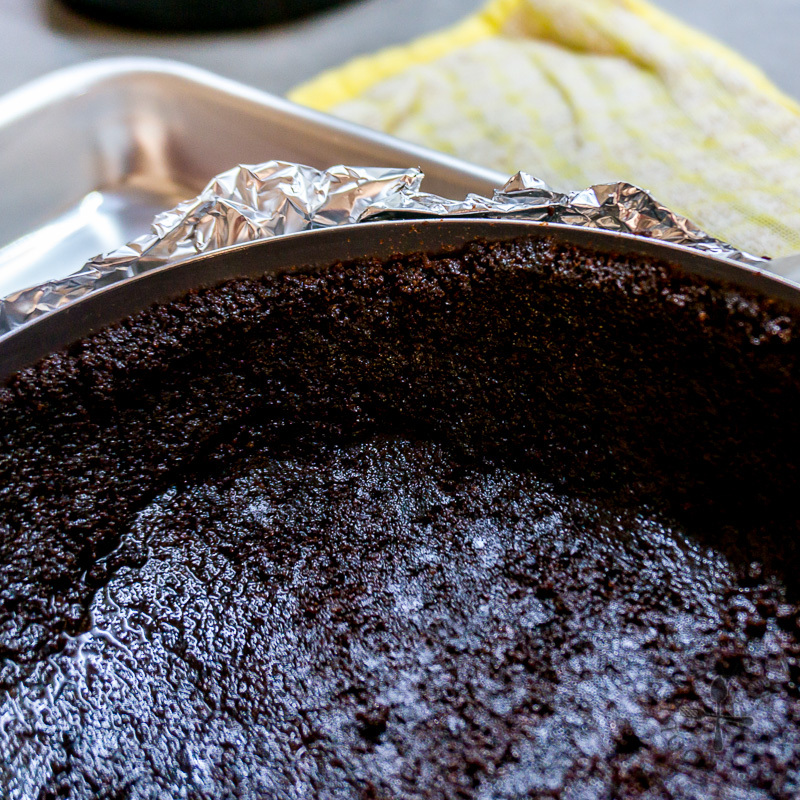 Press the crumbs onto the bottom and sides of the cake tin - the sides will come up to 4-cm (1.5-inch) tall. Chill in the refrigerator while you make the Chocolate Ganache. Finely chop the dark chocolate. 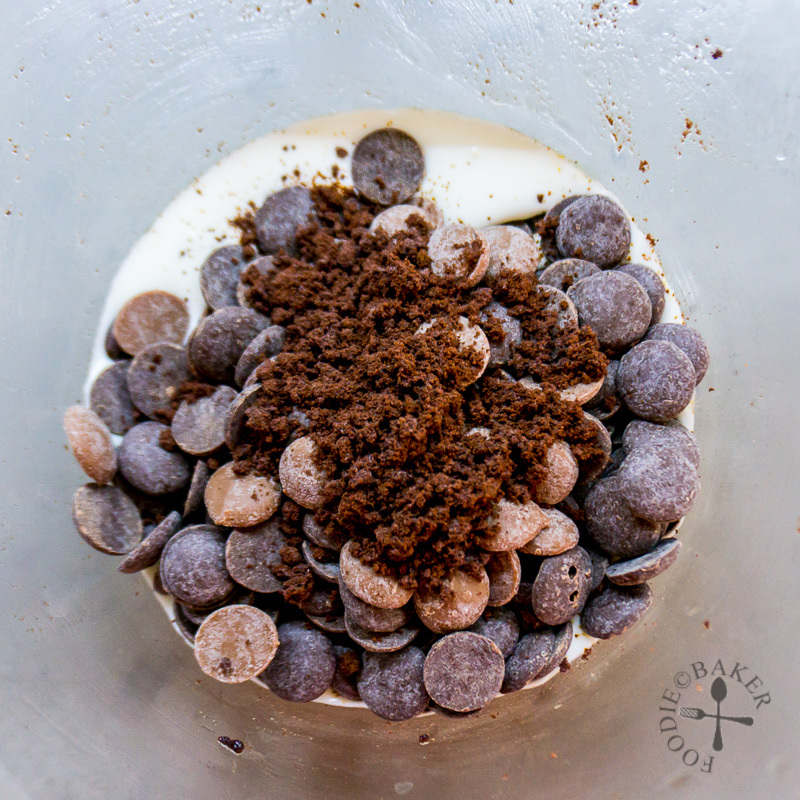 Place the chopped chocolate and instant coffee in a bowl. Place cream in a small pot and bring to a simmer. Pour the cream over the dark chocolate, cover with plastic wrap and set aside for 5 minutes. Whisk with a wire whisk until chocolate has completely melted and the mixture is smooth. Stir in the rum. Alternatively, microwave chocolate, cream and instant coffee in 30-seconds intervals, stirring every interval, until chocolate has melted and mixture is smooth. Stir in rum. Pour half of the Chocolate Ganache mixture into the Cheesecake Crust. Reserve the other half for the topping later on. Freeze the Cheesecake Crust for 30 minutes. Preheat oven to 175C / 350F. 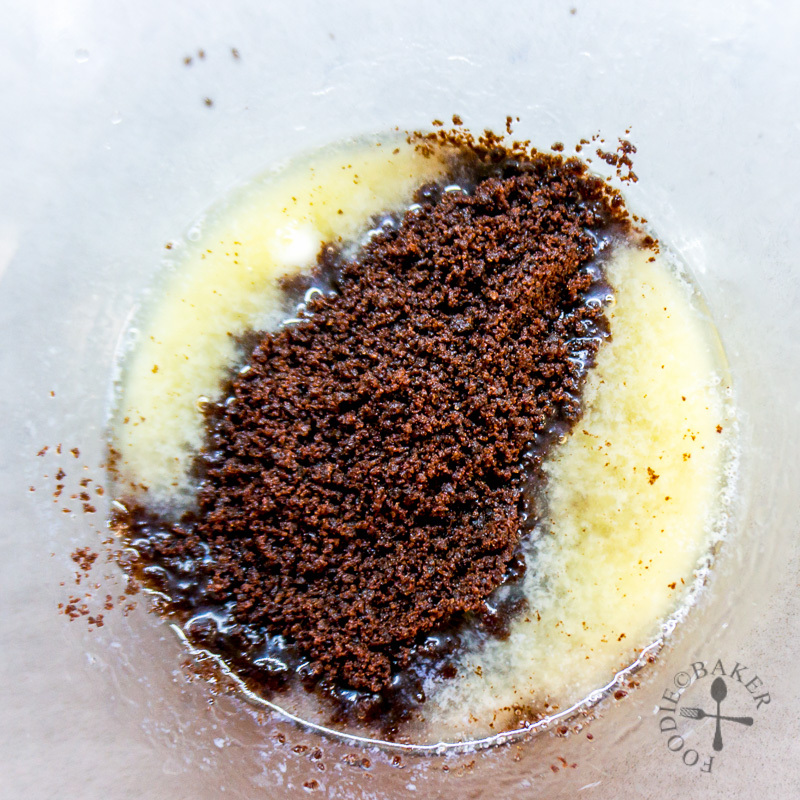 Whisk instant coffee, rum and vanilla in a small bowl until coffee has dissolved. Set aside. 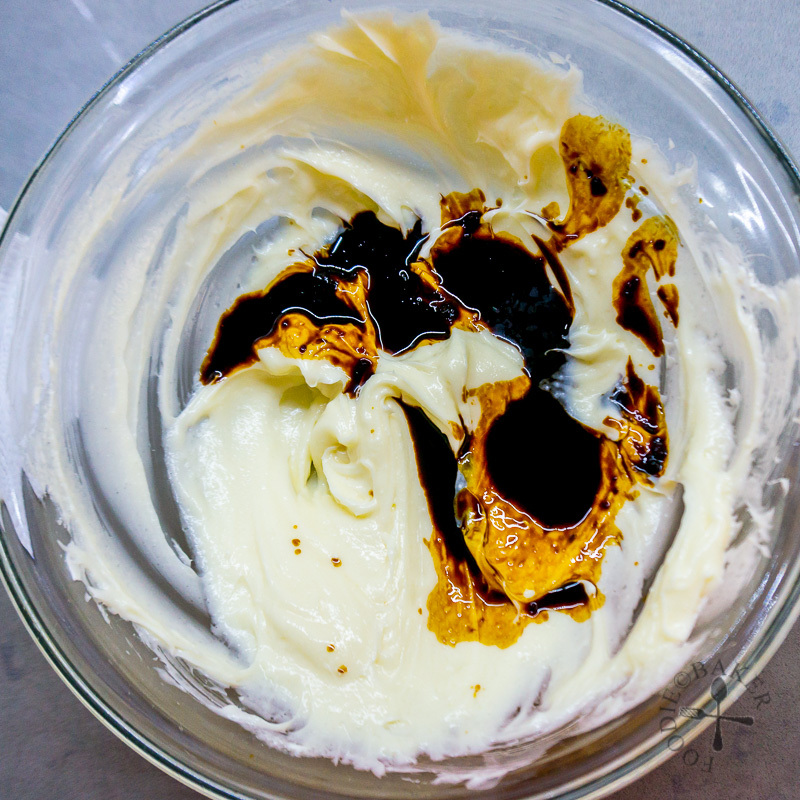 Place the softened cream cheese and sugar in a mixing bowl. Beat on low speed with a handheld electric mixer (or you can mix manually with a wooden spoon) until the mixture is creamy - the sugar granules won't dissolve completely but it's okay. 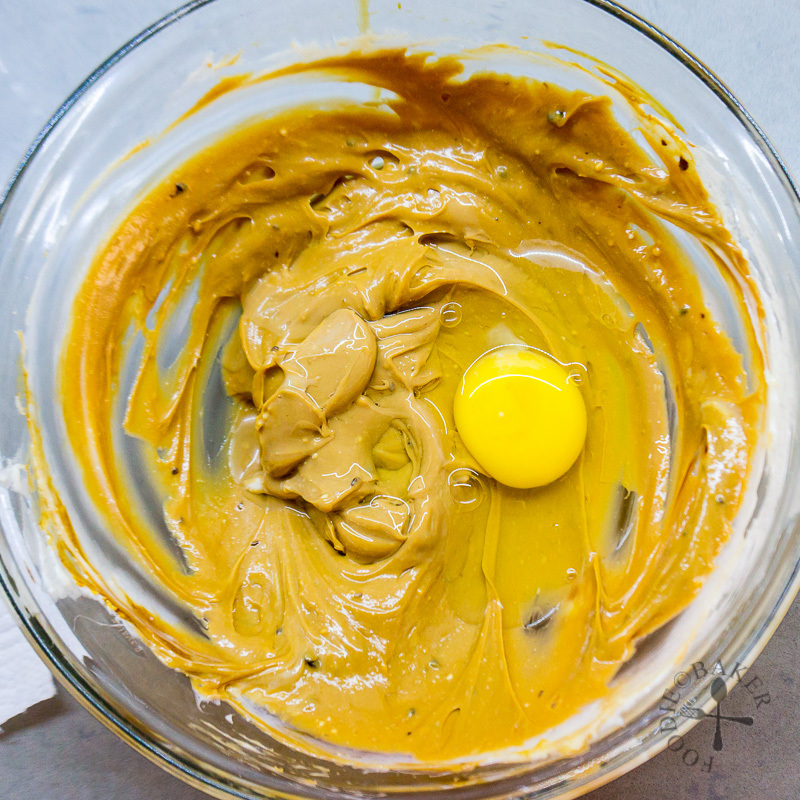 With the mixer on low, beat in the coffee-rum-vanilla mixture, egg and lastly flour, until everything is well-mixed together. Don't beat for too long as you don't want to incorporate too much air in the cheesecake batter. Pour the cheesecake batter into the frozen Cheesecake Crust. Bake in the middle rack for 45 minutes to 1 hour, until the cheesecake jiggle slightly in the center. Place the baked cheesecake on a wire rack and let cool for 30 minutes. 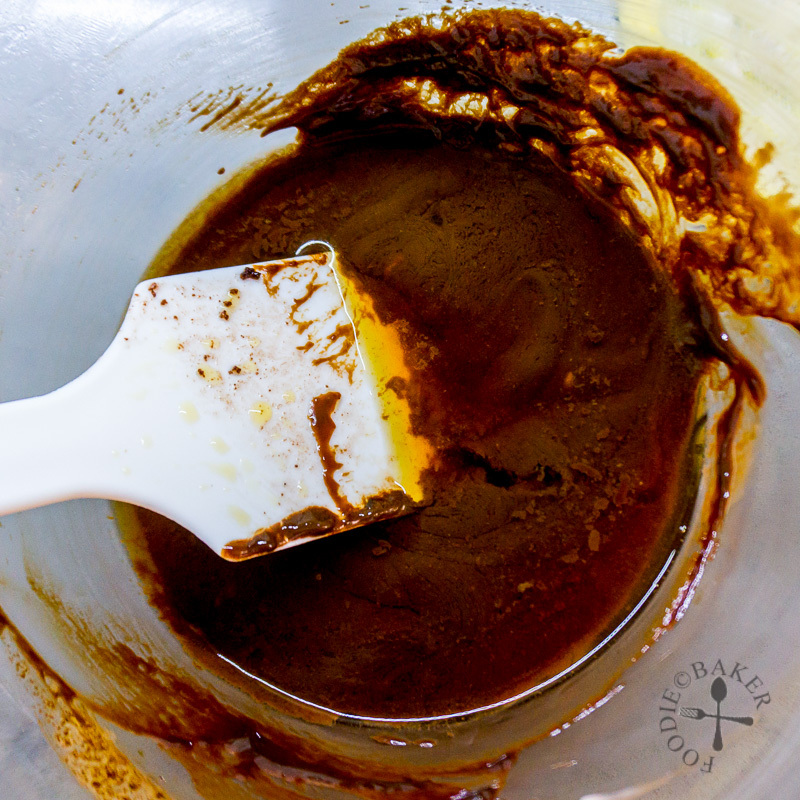 If the remaining chocolate ganache has hardened, heat it up gently over a double boiler or in a microwave until it's runny. Pour the ganache over the cheesecake and spread to cover the top completely. Chill the cheesecake in the refrigerator for at least 4 hours until completely cold, preferably overnight. Run a thin spatula or thin knife around the cheesecake and remove the cheesecake from the cake tin. Dip a knife in hot water, wipe dry and slice the cheesecake for a clean cut. Leftover cheesecake can be stored in an airtight container in the refrigerator for up to 5 days. Mmmm, this is the sort of cheesecake that I’m a big fan of, well done for cooking it because like you say you’ve kinda gotta be prepared. Amazing pics, I can just taste it…. well almost. Now this is a dessert I want to get to know better. It is simply beautiful, but like you cheesecake takes a lot of planning so I rarely make it but order it often in restaurants. Hi Emma! Yes totally agree with the planning part for cheesecakes and tarts! That’s why I usually end up baking cakes, they are so much easier. Hope you get to know this dessert better to make them at home soon! 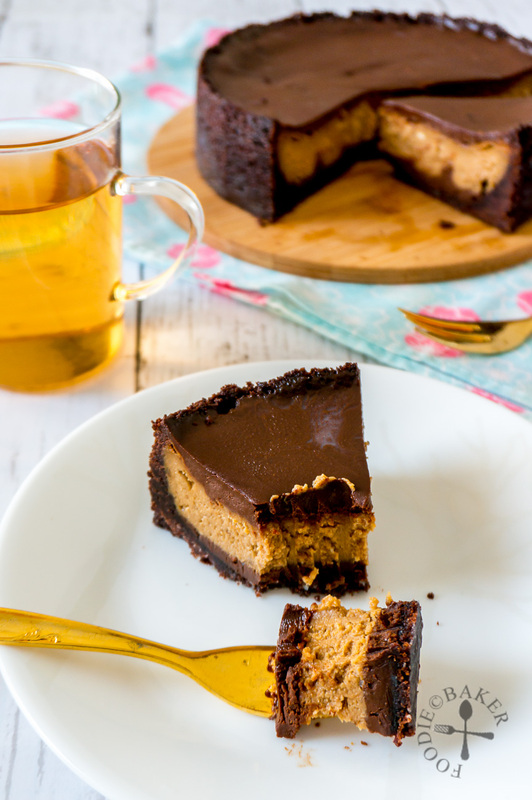 My goodness this cheesecake looks so decadent! I completely get the whole planning thing… it takes a while as you have to remind everyone not to eat the supplies while you are busy gathering up the items needed over several days in a foreign country that does not usually have these items. In the mean time kids and husbands, find the loot and you have to start all over again… LOL sharing, of course! Hi Bobbi! Luckily I don’t have hungry teenagers that will ravage my supplies before I bake what I want to! I can totally imagine what a frustrating and funny moment that is xD Thank you for the love always, Bobbi! I haven’t made a cheesecake in ages either but this one is definitely temping me. All my favorite flavors! Looks divine! love cheesecake and this look delicious !! Hi Gloria, thanks for the compliment! Beautiful cake! And looks delicious too! Especially when it has rum in it! Yum! Thank you so much Ann, wish I can send you a slice! Hi Suzanne, thank you so much for the compliments, I loooove this cheesecake to bits too!